Following on the work of Grzibovskis and Heintz, who proposed a threshold based algorithm for generating the Willmore flow, we devise algorithms for generating other high order geometric motions, such as motion by surface diffusion and Willmore flow with lower order terms, through alternating convolution with a Gaussian and simple thresholding. 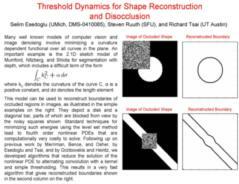 Esedoglu, S.; Ruuth, S.; Tsai, R. Threshold dynamics for shape reconstruction and disocclusion. Proceedings of the ICIP 2005. Esedoglu, S.; Ruuth, S.; Tsai, R. Threshold dynamics for high order geometric motions. Interfaces and Free Boundaries. 10:3 (2008), pp. 263-282.